David, Matthieu, James, Diego, Samridhis, and their Instructor Judy are all smiles as they celebrate Ground School Graduation Day! English is the language spoken by all pilots around the world. No matter where you attend flight school, and no matter where you find employment as a pilot, the language you use to communicate with Air Traffic Control (ATC) and other pilots is English. Aviation terminology can be a challenge for student pilots whose first language is not English. However, here at Epic we successfully train thousands of students from around the world who speak English as a second language, so you can do it, too. It is imperative that you are able to speak, listen, read, and comprehend English with ease in order to complete your training and become a commercial pilot. All flight students must communicate in English at ICAO Level 3 Language Proficiency Requirements. This is a safety requirement. What if I enroll at Epic Flight Academy but still have challenges with English? Occasionally we do welcome international students who score sufficiently in their English proficiency to be accepted, but upon arrival in Ground School, we discover that they could use some assistance with their English. To help these students, we offer English tutoring on a case by case basis. We highly recommend the English Language Institute at Daytona State College, which is approximately 13 miles from Epic. Every English tutor at Epic is trained in teaching English as a second language and will review vocabulary and topics you are covering in Ground School. English tutoring classes are custom-designed specifically for each student in order to focus on their unique needs. With customized English lessons, students who receive tutoring are able to keep up in Ground School and make regular progress in their aviation studies. For non-native speakers, learning English well enough to communicate with ATC and other pilots keeps many qualified students from applying to flight school. If English is not your first language, mastering Aviation English is the first step toward being accepted into a pilot training program. The most difficult challenge reported by our students is communicating with the control tower (ATC). 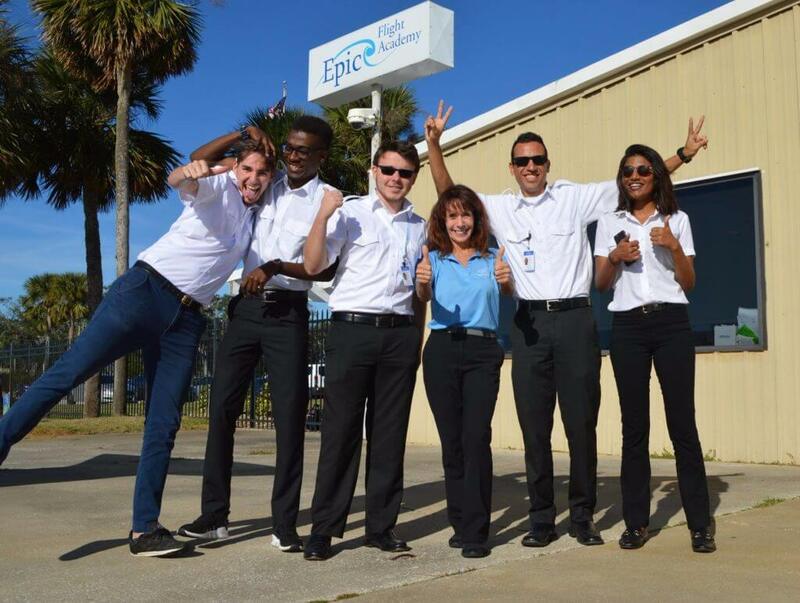 Before you arrive at Epic, we strongly encourage you to listen to Live ATC at New Smyrna Beach Airport (KEVB) and practice your listening skills so you can understand the tower. This is the single greatest challenge faced by some of our international students. How can you assess your English skills? We want to help. Before our students are accepted here at Epic Flight Academy, we have them go through a screening process to be sure they understand English sufficiently to enroll in flight school. This is for their benefit. You wouldn’t want to travel the whole way to the U.S. to begin flight school unless you were sure you could understand the instruction. You can assess your current English ability online. This is a free service. You may already be proficient enough to enroll in flight school. If not, you can return to this site to measure your progress as you continue to improve your English. What can you do to continue to improve your English? If you are not proficient in English, you can take classes in English, either in your home country or here in the U.S. Before beginning flight training here at Epic, many students attend English classes at Daytona State College in their Intensive English Program or the English for Academic Purposes program. If you are unable to attend English classes, here are some websites to help you learn English well enough to begin your flight training in the United States. Massive Open Online English Courses (MOOEC) are available free. We have listed some of the best sites here to help you improve your English. 1. Where can you learn basic conversational English? Alison offers free online English classes that help you improve communication in social settings. Click here to begin learning conversational English. 2. Is there a course for casual English in public settings? Yes, you can learn English for meeting new people, going to restaurants and movies, and job-related English. This free online course is available here. 3. What are some common mistakes to avoid? You can take this free online course that covers the most common mistakes made by English language learners. Don’t feel badly – many Americans make these mistakes and would benefit from this course, too! Click here for this free MOOEC. 4. How can you practice listening and understanding spoken English? FluentU has developed real-life videos that helps you listen to and understand spoken English. They even have an app for your phone. To learn more about FluentU, click here. Many of our students find that watching movies on Netflix (or some other movie streaming service) is especially helpful when they add English subtitles. They tell us that they can hear the English words said by the actors, read the word in the subtitles, and make the connection. If they see and hear a word they can’t understand based on the context, they simply pause the movie and look up the word in their native language. Other ways to practice listening include: watching American TV shows, movies, or news broadcasts; listening to American podcasts or music; or even better, listening to live communications at Air Traffic Control (ATC) here in New Smyrna Beach, Florida – the single best skill you can acquire prior to arriving here for classes. 5. How can you practice speaking in English? Sing along to American songs. Most lyrics are available online so you’ll know you’re singing the right words. If you have difficulty pronouncing a word, Dictonary.com has a feature that lets you listen to the pronunciation of all English words. Just click on the speaker icon to hear the correct pronunciation. Teach the English you already know to someone else. By teaching what you are learning, you will strengthen your own skills very quickly. Find an online video pen-pal, perhaps someone from a forum like Reddit. Use Skype or FaceTime to practice speaking. You can also practice speaking by thinking in English or even talking to yourself. You can even spend a few minutes speaking into the mirror each day. 6. What other free resources are there to help learn English? a. Dave’s ESL Café – This website has a section titled “Stuff For Students” that includes a Help Center, Grammar Lessons, Idioms, Phrasal Verbs, Quizzes, Slang, and Student Forums where students share tips, questions, ideas, etc. b. English Daily – Here you will find helpful topics, such as Slang, Idioms, Vocabulary, Proverbs, and Conversation. c. Exam English – This site offers free practice tests so you can gauge your English proficiency and monitor your improvement. d. American English – The U.S. State Department provides links to learn about American culture with numerous resources including games and songs. e. Voice of America – This site includes various skill levels for learning American English using videos and other resources. f. Easy IELTS – This site is recommended by our students for practice in reading and writing in English. The lessons are usually based on news stories or other topics people are discussing. g. 100 Common Verbs – This site helps you with the most common verbs used in the English language, including the 20 most common irregular verbs. h. Most Common Words – This is a list of the most common words written in English. In fact, the first 100 words make up more than half of all written English. We encourage you to master this list as quickly as possible. i. MzeroA.com – Many of our students recommend this free app. Their videos are especially helpful for trying to understand ATC communications. This means, if you can explain it to someone else – if you can teach it to others – you have learned the material! So, as you practice learning English, especially Aviation English, take every opportunity to teach aviation concepts to someone else. Maybe they have little or no interest in ground effect, aerodynamics, or magnetic compass headings, but you do! Ask them to listen and try to understand. Ask them to ask you questions so you can clarify and explain. Every time you teach something to someone else, you master the language (and the content) that much more. We encourage you to practice and test yourself from time to time so you will soon be ready to enroll in flight school and pursue your dream of becoming a pilot!